How Did We End Up In Cyprus? You may ask how did we get here well what can I say…….we both loved Cyprus and decided that we would love to have a home here so we decided to sell our home in London and purchase a property here in Coral Bay – of course it was also our intention to buy another property in the UK that we could live in too – we wanted to get away from London we both hated it – so busy all the time and not something we enjoyed especially on weekends we were always trying to get away to the countryside. We had initially intended to move back near Stamford in Lincolnshire and had spent many weekends there viewing properties but we never seemed to find the one we wanted. On one visit to Cyprus we looked at another property almost identical to ours and on the same road – we loved it and could see the potential as a holiday let which is something we both were very keen to do, but we weren’t sure if it was the right thing to do so we left it – this was March 2015 – then we returned June of the same year and it was still on the market – and of course we didn’t do anything about it on this visit either. Back to work after our holiday and sitting at my desk in the office I thought ‘what am I doing here? Why don’t I change my life, considering I had been in an office all my life I just needed to take the big step. I felt very institutionalised having got up and gone to work every day since I was 16 5 days a week and worked long hours some days depending on what I needed to do. I decided there and then “Life is for living” so I text Phill to tell him I had put in an offer on the property in Cyprus and expecting him to say don’t be stupid – he said “how much?” So here is where it all began!! I contacted the seller and started the process of purchasing our lovely villa which is called Villa Corrado. Phill loves the Sopranos so if you watch it you will recognise the name. As we were both still working we used a property manager to run it for the first year and then as my contract in finance came to an end we decided to give Cyprus a chance and manage the property ourselves and experience a whole new life in Cyprus. Now I can’t believe we are actually in the month of July and we have been in Cyprus just over 10 months. We arrived in Cyprus on our adventure on the 31st August 2016. I will never forget that day we had so much to do in the UK before getting on that plane. I had been packing boxes for weeks and they were all lined up around the house in every available space we had. I was just waiting for the final day to give it the extra push to get the last couple of boxes ready. Fifty four boxes in total (contents all nicely documented) were taken from the house and that didn’t include any furniture that was going nor did it include any of Phill’s tools that were outside in his shed – there was so much stuff to go and that was even after clearing out what we didn’t want to take with us. The removal lorry was arriving on the 30th August to take everything to the shipping agent in preparation for the container to be loaded on the 31st August. I recall sitting outside in the driveway (sun shining and very warm) waiting for the final items to be loaded to the lorry so that the final checks could be done on the house ensuring we had taken everything, lock the doors and say a final goodbye to the house we had lived in for the previous 18 months. Of course it wasn’t over for Phill as he had to go to the shipping agent and unload everything in readiness for the arrival of the container at 8am the following morning to load it to our 20 foot container for its merry voyage to Limassol Docks in Cyprus. We were both exhausted that evening and all we wanted to do was get some food and relax for the evening. We checked into a hotel in Cheshunt which was only a 20 minute drive from the shipping agent. The next day arrived and we had lots to get on with……I dropped Phill off at the Shipping Agent in order for him to load the container. There is a time constraint on how long you can take – they give you 3 hours to get it done so there was lots to do. I was told I wouldn’t be any use so off I went to Costa Coffee for my last Cortado and a final walk around the local shops. Costa Coffee CortadoThe container was at last loaded and the next thing we had to do was to drop of the Grand Cherokee at the shipping agent as my little baby AKA Chuggy was also coming with us to Cyprus. Felt too sad to leave him behind. Finally everything was done and we were making our way to Stansted Airport for our 5pm flight to Paphos. Couldn’t believe it we were on our way!! Now all we had to do was get there and wait for the car and the container to arrive. How difficult could it be? Well it was easy the car was a RORO (Roll on Roll Off) the ship (cars only) so a few weeks later on 26th September we were notified that the car had arrived in Limassol and we could collect it. Great I thought we have the car now all that remained was to have it registered with Cyprus Plates – of course nothing is ever straight forward – if we didn’t want to pay emissions duty which the Cypriots Charge we have to prove residency in Cyprus otherwise there was going to be a hefty €12,000 charge. So we had to get our “yellow” residency slips. That seemed to be the easy part as now we are still working our way through additional information that is required by the ministry of transport so that we do not have to pay this duty as the car is worth less than this charge. Fingers crossed it will soon be finalised and the car can remain without having to pay this fee. Otherwise it could be in for another sail across the ocean back to good old Blighty! Well the container on the other hand was a different matter. We should have got it at roughly the same time as the car albeit they were going on different ships, however, after some communication with the the shipping agent when our car arrived we discovered that the container was missing and that the docks had been checked but there was no sign of it – it was lost. The shipping agent was advised by the shipping company at the docks in Southampton that they thought it was on its way to Singapore but they wouldn’t be able to confirm that until they had unloaded the entire container ship at Singapore on the 4th October. When Phill told me I couldn’t help but laugh hysterically, all our worldly possessions in a 20 foot container without insurance, lost. We started to do some research into containers lost at sea and found a number of websites some stating anything from a couple of 100 to 10,000. The world shipping organisation states however that this figures is grossly overstated. Phewwww!! Having arrived in Cyprus it was of course still summer and the temperatures were high even in England when we left so we had arrived in shorts and flip-flops and of course we weren’t prepared for the cooler weather which would start to come in as it got towards December – a little shop was in order to ensure that we had clothes so did an on-line shop through FatFace – and lo and behold the package arrived a couple of weeks into October. We were ready for the cooler climes to follow. I could tick the delivery system of my list as I love shopping in FatFace. Anyway back to the container. The ship destined for Singapore docked and unloaded and sure enough there was our lost container sitting in Singapore waiting for us! Nothing is ever straight forward of course – the shipping company asked us where we wanted the container to go – we couldn’t believe our ears – they asked if it should be returned to England or did we still want it in Cyprus – we wanted to say “What do you think?” but we were just so pleased that it had been located. Unfortunately for us there was no direct route from Singapore to Limassol and we were also advised that it would be simpler if was sent back to the UK to start its journey again. It was therefore put on the first available ship to the UK and then start its journey once again to Limassol from there. We got the container on the 3rd December just in time for our return journey to the UK on the 6th December – at least it was a happy ending and we even had jackets and scarves to wear too! So here we are today running our property rental company in Coral Bay, living in a country that BBQs can happen every day of the year as the weather is guaranteed to be good unlike the UK. The roads are quiet and there are no queues in the supermarket. This laid back island is lovely…..there is so much to learn about the climate in terms of what can and can’t grow and at what times flowers and vegetables can be planted. 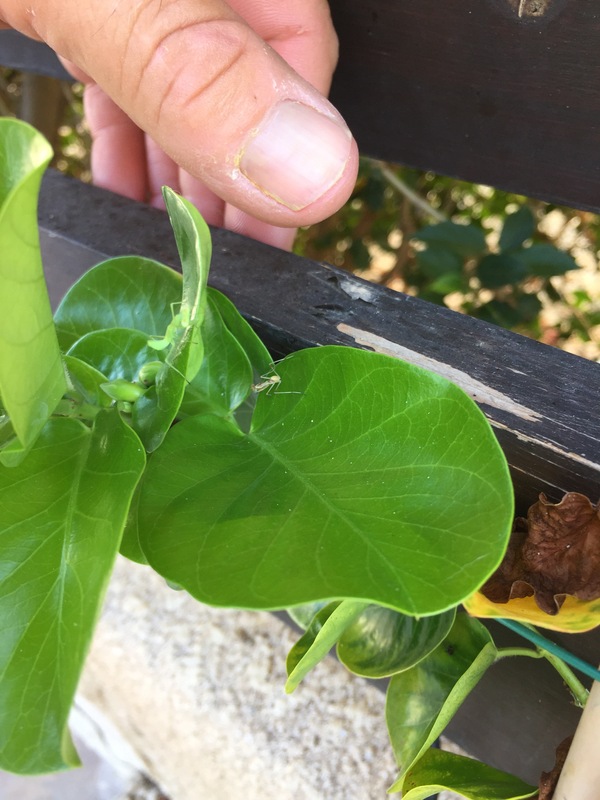 Each season there is something different for us to deal with/manage – from Millipedes in the winter months to cicadas in the summer Cyprus Cicadas. We are learning daily – Phill especially is learning so much as he is dealing with pesticides, insecticides and herbicides. He has been spending lots of his time learning about how the fruit trees grow and what they need to sustain fruit. Likewise how much watering is required as they shouldn’t be over watered or under watered so it is a difficult task to know what each plant requires. However we will definitely have some fruit this season unless something terrible happens. Just look at these trees and plants we have growing in the garden now. We are definitely getting there. We have around 30 grapefruit this year on the tree, a big change from last year where we only had 2 – the lemon tree has about 80/90 lemons and it continues to flower and produce more fruit each day. The baby fig tree has at least 8 figs on it and we only got it 4 weeks ago. The peppers are looking great too – and lovely to be able to pick for cooking. And of course not forgetting the Basil – it had a shaky moment with too much sun but is now doing great and we love it with tomatoes and mozzarella cheese. Why not following the blog and see what else we are getting up to as we settle into our life here in Cyprus. Every day there is just so much to learn – we love it!! Watch out for our next adventure in Pool Maintenance and Cypriot Construction!! Baby Praying Mantis in the Garden!! 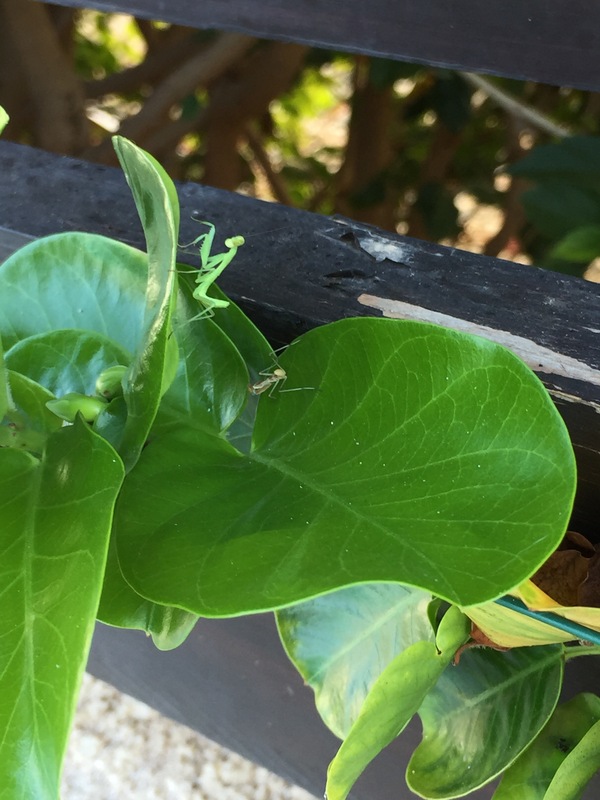 As you know if you followed a previous blog Gardening Discoveries I already mentioned the praying mantis and showed you the photographs too. Well here are more but this time it is the baby praying mantis which was in our garden. Phill and I were so excited to see them on one of our climbers the other day. Phill saw about 5 of them wandering over the plant but unfortunately I have only ever seen 2 and been able to take photographs and a couple of videos of them. They are so cute I wanted to adopt them into our family but perhaps not such a great idea after all they below in the wild. You can get an indication of size too if you compare it on the finger – can you believe it. Their size ranges from 1/2 inch to 6 inches!! I also managed to video one of them but these youngsters moving so fast and I couldn’t keep up with them on the video, they are so amazing. If you’re unfamiliar with praying mantis, you should know that they are wonderful bugs to have around in the garden. The little ones will gorge themselves on aphids, flea beetles and other tiny pests, while larger mantises eat cabbage moths, beetles and, occasionally they have been spotted snacking on large spiders, frogs, lizards and even snakes. Mantises have also been known to eat one another. Hungry praying mantises don’t discriminate. However, as with all insects and animals there is a sinister side to them as they are formidable hunters, and silently blend into their surroundings before snagging prey on their powerful front legs. A first-of-its kind study has found that praying mantises across the globe regularly kill and eat small birds as well, and studies have found that they could threaten US hummingbird populations. They normally live for about a year. In cooler climates, the adults lay eggs in autumn, then die. The eggs are protected by their hard capsules and hatch in the spring. Females sometimes practice sexual cannibalism, eating their mates after copulation. Mantises were considered to have supernatural powers by early civilisations, including Ancient Greece and Ancient Egypt. Mantises are also among the insects most commonly kept as pets. Forget getting a dog get a mantis !! Can’t believe it managed to see another 2 little baby mantises today 7th July – look at the size of them they are quite incredible!! Cyprus has many different types of palm tree and far too many to mention here. In our garden alone there are 3 species of palm 1) The Royal Palm, 2) the Sago Palm and 3) The Fan Palm. They are all very interesting once you start to learn about them and how each one differs from the other. Royal Palms are one of the most splendid species reaching 70 ft in height and can be seen all over Cyprus. In spring these palm trees grow pods which once grown to their full height they split open and bear their fruit. The pod sizes vary and can be very heavy ranging from 5 kilograms upwards depending on when they are harvested from the palm tree. The photographs below show the pods prior to it opening as well as one pictured before it splits open. These have been removed from the palm tree prior to it opening. The weight of the pods below were circa 15 kilograms. So heavy to hold as I found out. The photograph with my foot in it gives and indication of the size of these pods. The pods once left to dry turn a beautiful dark colour and can be painted and used as decorative ornaments. The Sago Palm is much smaller than the Royal Palm and grows very slowly. Although a very interesting species of Palm the Sago Palm is extremely poisonous to animals and humans if ingested. All parts of the plant are toxic; however, the seeds contain the highest level of the toxin cycasin. Cycasin causes gastrointestinal irritation, and in high enough doses, leads to liver failure so best to avoid eating the nut like fruit on them. Yesterday (21st September) I took more photographs of the sago palm to show how it has grown in the last couple of months. Aptly named as the fronds of this palm actually look like a fan that we often use to fan ourselves when the weather is warm. They too grow pods like the Royal Palm but look entirely different. They resemble tentacles of an octopus which grow large and when they develop to their full size they open and produce hanging berries which ripen and fall. For all palms the fronds grow continuously although growth is much slower in the winter. Of course as fronds grow and sprout from the top of the palm the older fronds below die. Once dead they are removed and the tree trunk begins to get longer as new growth continues. This of course takes a very long time. Today 6th July 2017 Phill cut further dead fronds from the fan palm as well as the tentacles I mentioned above. This should make it easier to see what they are like when they are cut from the tree. When they grow they are all green and then as they develop they break open with these white flowers – the bees absolutely love them and sometimes it is difficult to get very close to them as there are bees crawling all over them. The tentacles are very long and grow in excess of 5 foot long. Keep your eye out for the varying types of palm when you are on holiday even if you go to the west coast of Scotland as Palm trees are known to grow in the west of Scotland thanks to the effects of the Gulf Stream, which transports warm tropical water to the area.